Beyond the Cradle collaborator Rosaly Lopes starts her contribution to this blog with some words about Titan that will act as a teaser for the upcoming Cassini flyby of Saturn’s moon, to take place on April, 20 when the spacecraft will be at only 3600kms from the enticing moon. Understanding the geology of Titan is not easy. We mostly have low resolution data, the Synthetic Aperture mode in the RADAR instrument gets down to about 350 m, but that is about it. 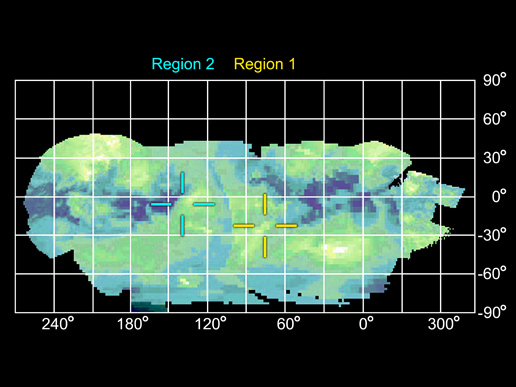 We have limited topographic data for Titan, and camera and VIMS instrument images are mostly low resolution. We don’t know the composition of the surface. So, there is still a lot we don’t know. But what we do know, thanks to Cassini, is very exciting. Titan is more Earth-like than anywhere else in the solar system. It has an atmosphere and a weather system, a “hydrological” cycle, only it’s not driven by water. It is driven by methane. Titan has methane rain, methane lakes and seas. We also see craters, but not many, indicating that the surface is young. We see river beds, and some rivers may still have liquid methane in them. We see dunes like those in the Namibia desert (where I’m hoping to go later this year). And we see volcanic features! They are not like those on Earth, they are cryovolcanic features, and the “magma” is water with probably ammonia or methane. We see craters that look like calderas, with flows coming out of them. We see many flows, though it can be difficult to tell which ones are volcanic and which ones are fluvial. Titan may even have active cryovolcanism. Three papers published recently (I was co-author of two of them) argue that brightness changes detected using the VIMS instrument are due to cryovolcanic activity. RADAR sees flow features on these two areas. The correlation between the flows and the brightness changes makes a good case for cryovolcanism. We have not seen a thermal signal yet, so the flows may not be active. Maybe what we have is some kind of degassing or fumarolic activity that is causing the brightness changes. I hope that before Cassini is over we will see a thermal signal in one of the areas that are thought to be cryovolcanic. That would be really great! For more information visit the mission’s website.